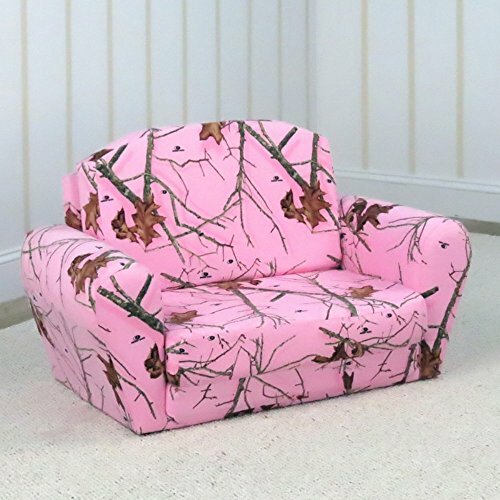 Kangaroo Trading Pink Mossy Oak Sweet Dreamer Novelty by Kangaroo Trading at Indsight. MPN: 2020MOLP. Hurry! Limited time offer. Offer valid only while supplies last. New, comfy Johnny tractor pull-out sleep/sofa featuring mixed hardwood frame with polyurethane foam padding for comfort and to avoid any sharp edges. New, comfy Johnny tractor pull-out sleep/sofa featuring mixed hardwood frame with polyurethane foam padding for comfort and to avoid any sharp edges. Gently curved backrest when in the upright sofa position that may be pulled out to a 48" deep sleeping surface. Features gently curved armrests for added appeal and comfort. This dreamer is Upholstered in the solid bright green polyester micro suede everywhere but the seat and inner backrest. The seat is a solid bright yellow polyester micro suede, and the inner backrest features a multi-colored scene with Johnny tractor, Corey combine and Barney backhoe on a field of green grass with a blue sky. The words "friends help friends" is shown in yellow letters outlined with green in the center of the sky portion. The bottom is covered in black upholstery fabric with plastic knobs on the bottom corners to avoid wear and tear of the fabric.